My mum offered to babysit, so off we trotted to Crabshakk. We decided to have an oyster each, and then share not one, but two plates of very well excecuted squid tempura-batter crispy, squid not chewy. I again plumped for the fish and chips, and the chip were as good as I remembered, better than Stravaigin and just as good as Mohr fish. HI had the whitebait which were deccent enough but not as good as those we have had in Barcelona. 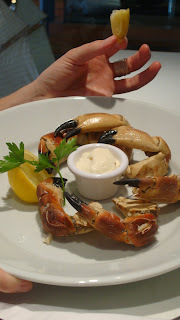 Rachel opted for the crab claws which were fresh and delicate in flavour but soon the novelty wore off as bits of shell flew everywhere. 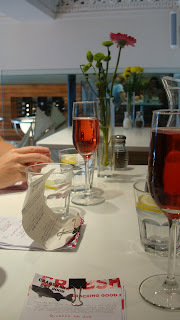 It was a very tasty and pleasant lunch and I am glad that this place is just round the corner from us. It joins Stravaigin as my go to place. We were also happy to hear that folk do take their babies there, and we even got the number of the best table to ask for, if accompanied by a sprog. As mentioned before the owners are husband and wife team, Lynne Jones and architect John Macleod, the architect behind Gandolfi Bar and Cafezique. 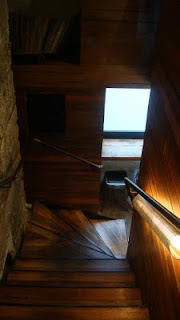 This staircase is pretty cool, I would like one in my house. 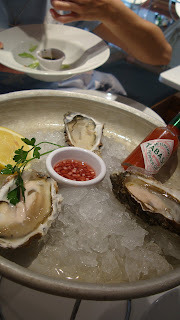 My first experience of oysters since Applecross and Torridon, Fortunately this experience did not end in disaster! 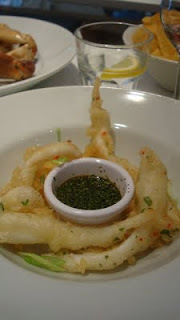 Excellent squid tempura, not chewy and not oily.